Whenever I see a book about Narnia I always pick it up and poke through it. If it looks like it could be evenly slightly promising, I'll purchase it and save it to read "sometime later." Knowing Aslan , by Thomas Williams was one such book. Actually to call it a book is somewhat stretching the truth. It's more like a 56 page tract that you'd leave in a bathroom somewhere, with hopes that someone who is interested in Narnia will pick it up. I know that sounds a little harsh. That rather summarizes my feeling about this book though. It's not anything remarkably special; it's a dull but quick read with a strong attempt at sharing the Gospel message. (And the Gospel message is not meant to be dull!!!) In this book Williams is predictably trying to share the good news with a non-believer by explaining how Aslan represents God. The only problem is that the Aslan and the god which Williams presents to His readers is lacking teeth. Williams explains how our human view of God is often so disturbing, wherein we picture a harsh God in the sky who is just waiting for us to do wrong so that He can punish us. Williams explains how Lewis wrote this story to show us how loving and kind God really is and how we should want to follow after Him because He is so joyful and friendly. Furthermore, Williams delivers his message as if talking to a 10 year old instead of to an adult which irked. Basically I found Knowing Aslan a bit on the dribbly side. Williams and I clearly have a few theological differences, most chiefly in the area of free will and predestination. In saying that much, you can probably guess that I believe we were predestined before the beginning of time to be (or not be) children of God. At the same time I do not believe that that in any way removes our responsibility to go forth and preach the Gospel to all nations. In fact scriptures command that Christians go and spread the news of Who God Is to all of the world. I firmly believe that God works through His people to share Himself with others. Now, I do understand why some Christians like the use of tracts and I don't have any huge or hearty objection to this means of reaching people. It's just that I find tracts generally have a very watered down message, replete with a lot of begging and pleading for the hoped-for reader to dedicate their life to Christ. Knowing Aslan was no exception. "Jesus loves you so much that he died for you, and he longs for a relationship with you. But you still have free will, and he will not force himself upon you. If you choose to remain apart from him, he will be heartbroken, but he will honor your choice." I'm going to stop it there and explain that I agree that Jesus does love His people wholeheartedly. He is a very kind, merciful and gracious God, full of love and compassion. (How do I think this when I believe in predestination? These are age-old questions and long debates. I believe He is most gracious to save any of us. Yet He does. What a gift! What an incredible, beautiful gift!) He did absolutely die for our sins and if we will believe in Him we will not perish but have everlasting life. Up to this point, I have no glaring disagreements with the passage. It isn't until we get to the sentence "he will honor your choice" that I begin to quibble. That sentence sounds so friendly, so very much like a discontented sigh at the most. But to reject God doesn't just leave us sighing and lounging about. To deny Christ and to walk away from Him leaves us in dire peril. If by "he will respect your choice" Williams means, "you will unfortunately receive what you deserve" then I agree. And I tremble for the person who does walk away as a result. God's message of good news - that He would save sinners - is good because His wrath is terrible. He isn't just a God of love or just a God of justice. He is both. He demands justice and because of His great love He offers to save us from the wrath required as a result of our sins. This is hard news. It is the best news. It is the most awesome news you will ever hear and I felt like Williams was attempting to water it down with his "jolly god". I do think that Aslan is picture of Who God Is for he roars when he conquers and he growls when there is sin. Then - when sin and death are conquered (usually through bloody battle) - Aslan REJOICES! You have to know the heat of battle in order to understand the glorious victory. Don't remove the hard part so that we can "just get to the good stuff." The good is good because the bad is bad. Yes, I do realize that this is a mere 56 pages worth of book and doesn't necessarily warrant a gigantic critique. Then again, if we let so many little pieces of bad theology in through the cracks we'll suffer from an even greater lack of understanding of who God is in His mighty fierceness and most excellent glory. To really know Aslan you must understand and believe that he has sharp teeth. 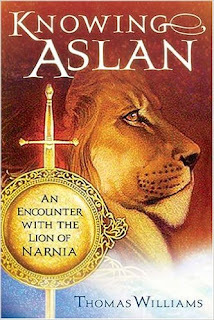 What an unfortunate tract - after such a promising title (for an encounter with Aslan could be a terrific thing!) It's interesting to me that while Lewis himself is clearly a "free-will"-er, he still manages to portray a toothy Aslan. Aslan has a significant degree of sovereignty (or at least, that's what I perceived to be a major theme in The Horse and His Boy) and certainly punishes evildoers and disciplines his own. your honesty. It's one of many reasons I love you.